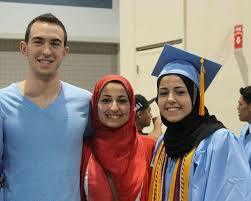 Trying to parse whether the senseless killing of three young Muslims at an apartment complex in Chapel in Chapel Hill, NC was a hate crime or a dispute over parking is an exercise in futility and a distinction without a difference. These three young people are dead in either case. Only a person full of hate could perpetrate such a heinous and outrageous crime against humanity. This chinless monster known as Craig Stephen Hicks is an abysmal human being living a life of quiet desperation collecting guns and burning a slow hate filled fuse. He was a ticking time bomb waiting to go off and the parking dispute was the detonator that set him off. What can we learn from this hideous crime? One, tolerance of intolerance is evil. We should always condemn bigotry in all its forms, be it racial, gender or religious. Two, this man should never have been allowed to carry a firearm, much less amass a cache of guns and ammunition. He was simply too irresponsible and incompetent to do so. Besides, who nee to have so many weapons? We need to have a serious conversation about the proliferation of guns in this country. Enough is enough already! How many more senseless killings will it take? How many roads must a man walk down? How many times must a weapon discharge? How many times must we turn our heads and pretend not to see?